My jack points squashed right through the frame rail so I supported the car where the trailing arms connect to the frame. Then I punched right through the frame and had to get a piece of metal welded in so my trailing links don't break right off. ...Also pull up the carpet in the rear hatch and check the side areas where the jack is stored and the opposite side. Water tends to leak in here. Both my sides rotted out. That's sunlight shining through the hole. If you run a carfax it may show maintenance, particularly the timing belt. If you don't have an OBDII scanner, get one. These cars tend to have various emissions issues. The most common ones are easy to fix and easy to figure out what is wrong if you know the code that is causing the CEL. If you do get a CEL scan it right away and get it fixed as soon as you can. It is much easier to diagnose and fix a car with one or two related codes rather than a 3 or 4 codes caused by 2 or more issues. 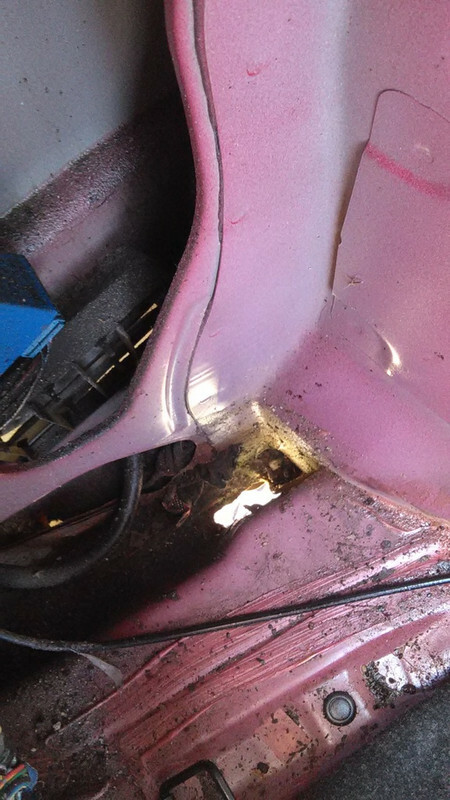 Rust - check for rust at the jack points and rear fenders. Also pull up the carpet in the rear hatch and check the side areas where the jack is stored and the opposite side. Water tends to leak in here. I don't trust carfax. They miss so many things most people never know. Entire accidents, maintenance, etc. I trust my own eyes. It only takes a few minutes to pull off the valve cover and look at the belt, and pretty easy to tell if it's been replaced or not. The car is 16-17 years old. If the belt is 16-17 years old it would be pretty obvious. Carfax def doesn't show everything. But... if it does show a T-Belt change then you can be reasonably sure that it was done at the indicated time. Plus, it can show where the car was serviced and you can call them and find out more info. Just one of the tools you can use. My daughter cant find her jack!